Charles Weygant, The Sacketts of America, "4507. Sabin Sackett, m. Martha Hill." Email from Erin Dennis to Chris Sackett, July 2018. 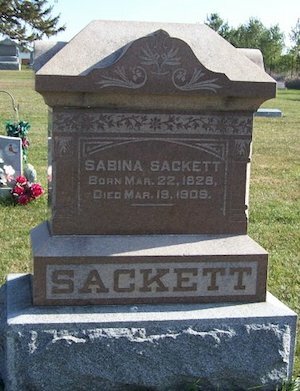 "Illinois, Marriage Index, 1860–1920", database, Ancestry.com, "17 Apr 1855, McLean County, Illinois, Sabina Sacket & Martha E Hill." The Pantagraph newspaper obituary gives Martha's date of birth as 17 Apr 1832. Her gravestone has 1 Dec 1838 and this is consistent with her ages stated in census records. Shoemaker, Elias, 22?, m, machinist, b. ? [Next door to E G Sackett]. Sacket, William, 2, b. IL. 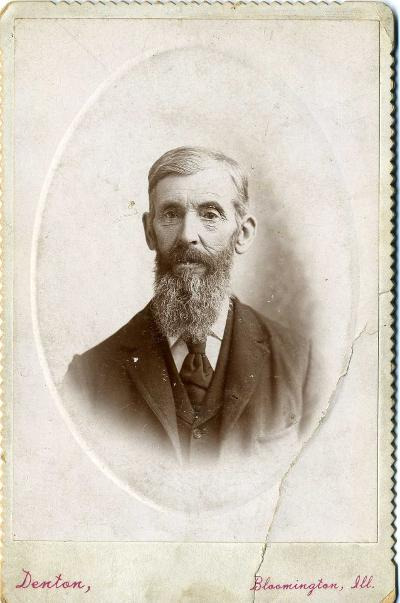 "US Civil War draft registrations records 1863–1865", digital image, Ancestry.com, "Sackett, Sabina, of Bloomington, 34, farmer, married, b. Ohio, enumerated June 1863, 8th district, Illinois, white, class I." Sackett, Anonymous, 1/12, male, b. IL, b. May. Sackett, Seth, son, 8, at school, b. IL, father b. OH, mother b. IL. "US City Directories, 1822-1995", digital image, Ancestry.com, Bloomington, Illinois, City Directory, 1889, "Sackett Martha E., (wid. Sabina), domestic, 920 W. Moulton. "; 1891, 1893, 1895, "Sackett Martha E (wid Sabina), res 920 W Moulton. 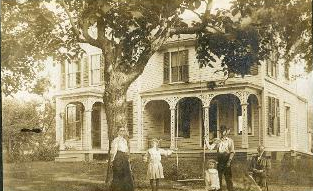 "; 1902, "Sackett Martha E Mrs, res N Adelaide, Normal. "; 1904, "Sackett Martha E, res 1021 E Front. 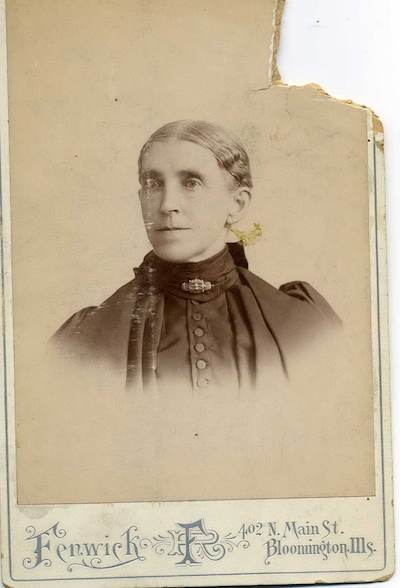 "; 1905, "Sackett, Mrs. Martha E., res. 1021 E. Front. "; 1907, "Sackett, Martha E. (wid. Sabina), res. 1021 E. Front. "; 1913, "Sackett Martha E (wid Sabine), r 1021 E Front. "; 1915, "Sackett Martha (wid Sabine), r 1021 E Front. "; 1917, "Sackett Martha (wid Sabina) r 1021 E Front. "; 1919, "Sackett Martha H (wid Sabina) r 1021 E Front." Myrldom, Margret, [relationship indecipherable], b. Apr 1884, 15, b. IL, father b. IL, mother b. IL, servant. 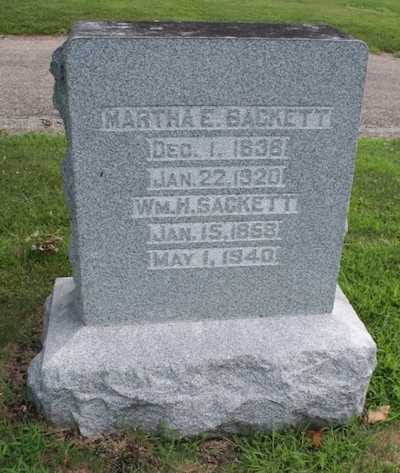 Sackett, Martha E, mother, b. Dec 1837, 62, wid, 6 ch, 5 living, b. IL, father b. KY, mother b. OH. Sackett, Martha E, mother, 68, wid, 5 ch, 4 living, b. IL, father b. KY, mother b. ? Sackett, Martha, mother, 83, wid, b. IL, father b. WA, mother b. IL.